Celebrate woodpeckers in your yard by feeding them the Pine Tree Farms Woodpecker Classic Seed Log. 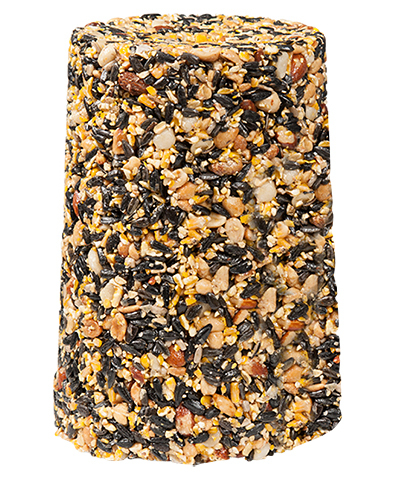 This mixture of peanuts, almonds, cracked corn, and sunflower seed offers woodpeckers all their favorite foods in one convenient place. The blend gives birds the nutrients they need to remain active, and its significant, fun log shape makes feeding simple. Place this large log into your existing Pine Tree Farms Classic Seed Log Feeder (not included), or rest it on a platform for more options. Gelatin helps the log hold its shape, allowing you to feed birds without the hassle of loose seed. Watch woodpeckers frequent your backyard to feed from this Woodpecker Classic Seed Log. Made in the USA. Note: This case pack includes 6 Pine Tree Farms Woodpecker Classic Seed Logs, 4.75 lbs. each.